So here’s what we were doing yesterday. I knew that egg whisk would come in handy for something. The body took the longest; once that was in place we managed to sculpt the details in about half an hour. We used plastic bowls from the kitchen for moulding the bumps. As is traditional with these things, the project was started with motivated enthusiasm by four of our family and finished by the grown-ups after the children got bored, but I have to say I’m rather pleased with the result. Of course, if it comes to life in the middle of the night, we’re royally screwed. 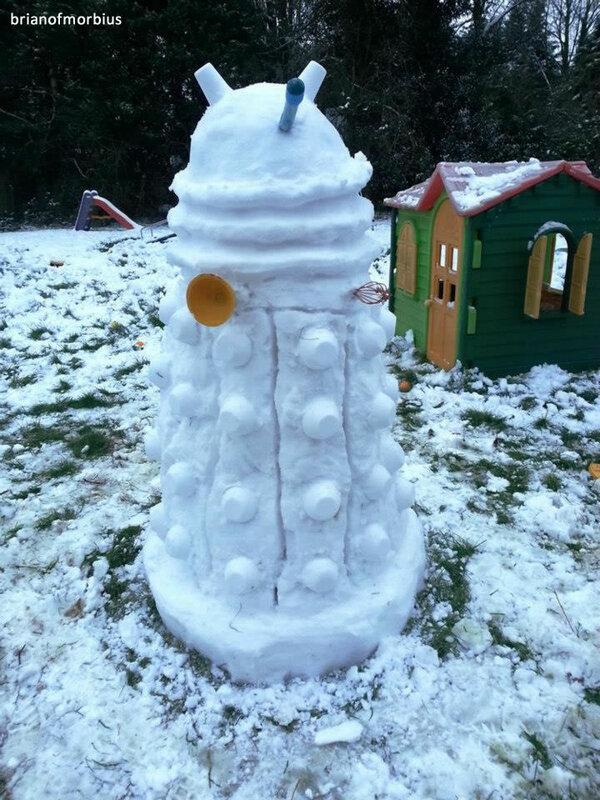 Snowman Dalek? Yeah, better keep some hot water handy. LOL nicely done! I have a super-soaker in the lounge, and the kettle is permanently boiling. Just in case.